Trinity School has celebrated the opening of their new Scrapstore Playpod, with the help of Mayor, Richard Ackroyd and two pupils Charlie and Maizie. Trinity School’s Parents Association has been working hard to raise the funds for the Playpod, which provides a huge range of scrap materials to offer more choice and creativity when it comes to playtimes. 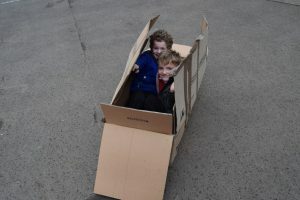 Frome Town Council awarded £500 towards the new Playpod which is full cardboard tubes, tyres, lengths of material, netting, ropes, crates and bins for the children to pick from. 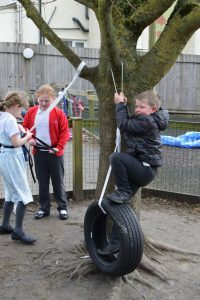 With no set way for the items to be used, the children’s inventiveness and creativity can be explored and enables all ages, genders and abilities to find ways to play and socialise together. The Scrapstore PlayPod is topped up with scrap materials on a regular basis and already has had great response from the children.